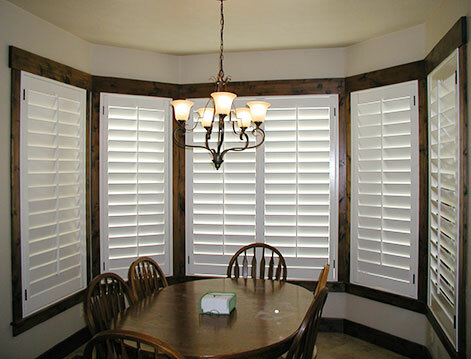 Shutters are a great way to change the presence of your home’s exterior. Choosing the right shutter color may increase the attraction of your home. First, decide whether the look of your home is more traditional or modern. Traditional-style homes often look best with classic white or black window shutters. More contemporary or modern homes often handle exterior window treatments with daring hues, such as bright red or vibrant blue. You want your shutter colors to work well with your current brick, siding, rock or paint, unless you are planning on changing the exterior of your home. Assess your home’s exterior at different times of day to see the color differences in diverse light. If you don’t have a decent color memory, take photographs of the exterior at various times of the day and from different angles. Contemplate the color of your window trim. Since the shutters and trim bump up against each other, most people paint them the same color so the whole window looks like a single piece. If you desire, select a shutter color that supplements the trim instead of matches it. Avoid using a shutter color that clashes with the window trim, or there is a possibility of giving your home a tasteless, flashy look.Select a few shutter colors that you feel would match your home’s exterior. For a delicate look, stay within the same color unit, with the exclusion of white or black, both of which go with any exterior color arrangement. For a dark-colored exterior, contemplate picking a shutter color a few shades lighter. Lighter exteriors often look enhanced with window shutters just a few shades darker than the house. For a daring look, use dark or brightly colored shutters on a light-colored house. Red, charcoal gray, or forest green can offer a perky pop of color alongside paler hues. You will want to choose colors that are steady with the houses in your area. You do not want to pick a color that will make your house stand out from the houses nearby you. Accumulate paint chips from a paint store in shades that complement your house. Narrow your color selections to three or four and obtain small jars of sample paint in the colors you have chosen. It is recommended to cut out squares of cardboard and paint the cardboard with the sample colors. Like suitable makeup, good use of color on shutters can boost your home’s look and increase its value. Shutter colors are normally a long-term obligation, so select a color that will suit you and your home for years to come.